Itema002121 - BCIT Business Management program image of the interior of a department store showing staff, shoppers and displays of goods. "November Sale Days". Itema002122 - BCIT Business Management program image of the interior of a department store showing staff, shoppers and displays of goods. "November Sale Days". Itema002123 - BCIT Business Management program image of the interior of a department store showing staff, shoppers and displays of goods. "November Sale Days". Itema002124 - BCIT Business Management program image of the interior of a department store showing staff, shoppers and displays of goods. "November Sale Days". Itema002125 - BCIT Business Management program image of the interior of a department store showing staff, shoppers and displays of goods. "November Sale Days". Itema002126 - BCIT Business Management program image of the interior of a department store showing staff, shoppers and displays of goods. "November Sale Days". Itema002127 - BCIT Business Management student working on a document at a drafting table. Itema002128 - BCIT Business Management student working on a document at a drafting table. Itema002129 - BCIT Business Management image of two students with an instructor teaching standing at a blackboard in a classroom. Item a002125 - BCIT Business Management program image of the interior of a department store showing staff, shoppers and displays of goods. "November Sale Days". 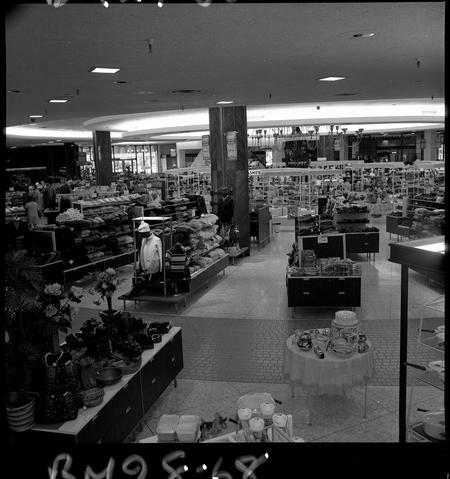 BCIT Business Management program image of the interior of a department store showing staff, shoppers and displays of goods. "November Sale Days".